For ISRC’s forty year life the inner city has faced one freeway proposal or another. The WestConnex is the latest proposal to solve Sydney’s under investment in public transport by a new freeway resuming houses and dumping cars onto already clogged inner city streets. 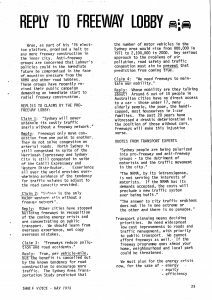 We think it is time to recycle some of the arguments from Inner Voice May 1978 in reply to the current freeway lobby. Wran, as part of his ’76 election platform, promised a halt to any more freeway construction in the inner city. Anti-freeway groups are concerned that Labour’s policies could in the immediate future be compromised in the face of mounting pressure from the NRMA and other road lobbies. These groups have recently revived their public campaign demanding an immediate start to radial freeway construction. Reply: Freeways only move congestion from one point to another. They do not solve congestion on arterial roads. North Sydney is still congested in spite of the Warringah Expressway and Sydney City is still congested in spite of the Cahill Expressway and Western Distributor. Experience all over the world provides overwhelming evidence of the tendency for traffic volumes to adjust to the road capacity provided. 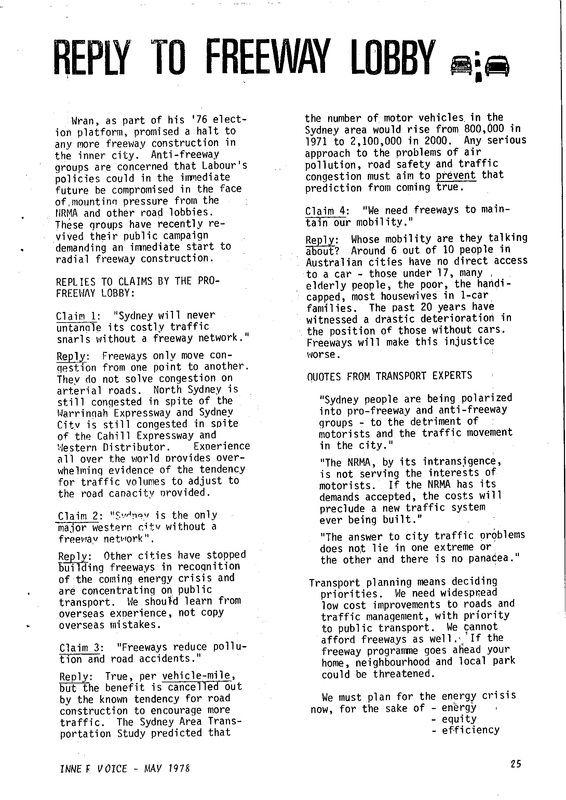 Claim 2: “Sydney is the only major western city without a freeway network”. Reply: Other cities have stopped building freeways in recognition of the coming energy crisis and are concentrating on public transport. We should learn from overseas experience, not copy overseas mistakes. Reply: True, per vehicle-mile, but the benefit is cancelled out by the known tendency for road construction to encourage more traffic. The Sydney Area Transportation Study predicted that the number of motor vehicles, in the Sydney area would rise from 800,000 in 1971 to 2,100,000 in 2000. Any serious approach to the problems of air pollution, road safety and traffic congestion must aim to prevent that prediction from coming true. Re 1 Whose mobility are they talking about? Around 6 out of 10 people in Australian cities have no direct access to a car those under 17, many , elderly people, the poor, the handicapped, most housewives in 1-car families. The past 20 years have witnessed a drastic deterioration in the position of those without cars. Freeways will make this injustice worse. Transport planning means deciding priorities. We need widespread low cost improvements to roads and traffic management, with priority to public transport. We cannot afford freeways as well. If the freeway programme goes ahead your home, neighbourhood and local park could be threatened.